Sixteen-year-old Sami hasn't seen her mother in ten years—and neither has anyone else. The police suspect Sami's father had something to do with her mom's disappearance, but Sami's never believed that. Her mother chose to abandon her and start a new life. It's that simple. But now, evidence has emerged about another missing woman who used to be involved with Sami's dad. Coincidence—or evidence that the cops have been right all along? As Sami investigates, she's forced to question everything she thought she knew about the dad who's always been there for her and the mother who supposedly abandoned her. And if her dad didn't kill her mother, what did happen? In Sahsa Dawn's young adult mystery Samantha is searching for her mother. Over the years she has received postcards from whatever new place her mother has been with the numbers 7 and 11, her mother's favorite numbers. But why hasn't she come back for Sami like she promised? The police believe Sami's mother would have never left without taking Sami with her, but Sami hopes that is the case because, if not, there's only one other option. Readers fall into Sami's story as the detective in charge of finding her mom reveals that there have been new developments to the case. They're making new connections that trace back to Sami's dad and his most recent wife Heather. The plot starts out strong: engaging readers and building up to what you might expect to be a complex mystery. Unfortunately, the story doesn't unfold in layers, but rather runs around in circles until the author finally decides to reveal what happened to Sami's mom. When the moment arrives to put the puzzle pieces together it doesn't add up to a strong finish. 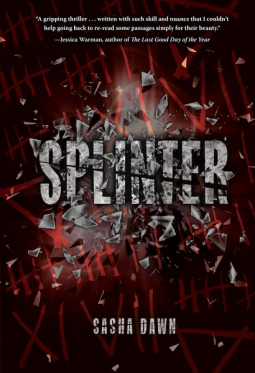 Where mysteries are usually webs of people, places, and actions connecting throughout the plot, Splinter proves to be more one-dimensional. For instance, a few characters are talked about, who could be key to cracking the case, but never fully brought into the picture. They remain in the peripheral instead of being brought into the thick of things for readers to analyze and flag as potential suspects. It's very emotionally driven as it focuses on Sami keeping up with her personal relationships in the heat of a scandalous case. I loved the concept and would have loved it even more if Sami took on a more amateur sleuth role. Her role in the story was very passive. She asks questions and stumbles upon clues that she doesn't realize are clues until someone points it out. If you're looking for a traditional mystery, Splinter isn't it. However, if you want a young adult contemporary novel with elements of suspense you've hit the jackpot.